The aim of this hand tool review is to see what the difference between the huge range of Irwin folding knives, pocket knives and retractable knives actually is. 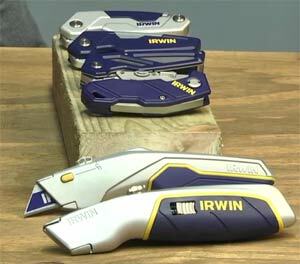 We worked with an Irwin representative and tool expert to find out. This hand tools review took the shape of a comparison test with all the hobby knives and utility knives on show in the video. This is by no means Irwin’s full range but it is a good indicator of the differences and usefulness of all the knives in the range. The first thing that must be noticed with all of the folding knives is that the blade cannot be withdrawn until the knife is locked in a 45° position. In this position it is almost impossible to use the knife properly so the chances of accidental blade removal are minimal. The idea behind all of the individual knives is evident in the video and does not need further explanation here other than to say they are all extremely sturdy and most definitely fit for purpose. Some of the knives hold spare blades which is such a bonus when you are carpet fitting or have a great deal of cutting to do. Changing the blade on something as cumbersome as the old hobby knife with a screw in the middle can add a lot of time to a job. Clipping and unclipping a blade (as you can with most of the Irwin range) is infinitely better and most definitely quicker. If you are laying a carpet (See how to do this in our how to lay a carpet DIY project) almost any one of these knives is good for the job. You are advised to use hooked blades for this job as you will see in our Hand Tool review on blades for utility and hobby knives. Additionally if you would like to find out about the range of blades available for Irwin knives, watch our review. Due to the range and type of knives reviewed here I can certainly say that the minimum rating would have to be 5 stars. Even the boggo-standard utility knives are great due to their chunky, comfortable feel when in-hand and easy blade change features which makes then streets ahead of lesser makes and models. When looking at the higher end of Irwin’s range, especially the FK250 and it’s incredibly useful screwdriver bit holder in the handle you can see why I have given 5 stars for the whole range, it’s hard not to!